PHOTO BY JOHNNY RANDALL. 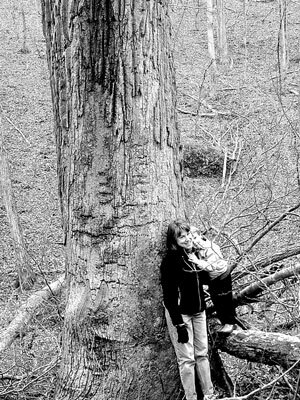 Libby Thomas and son Max are dwarfed at the base of Stillhouse Bottom’s sentinel tulip poplar. Not far from Chapel Hill’s Merritt Pasture stands Stillhouse Bottom. The Merritt family’s former land included the steep forested ravine known as Stillhouse Bottom, a name that initiates numerous stories from old-timers. The land was used for selective tree harvesting, farming on level terrain and, most likely, as the stories go, moonshining in the ravine bottoms. 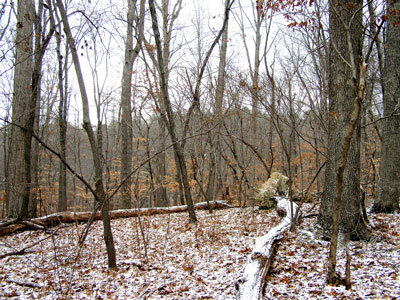 Thankfully, the Merritts were thoughtful stewards of the land; the forest on the steep slopes was never timbered, meaning it has been essentially undisturbed since before European settlement. That’s why one is able to stumble upon 250- to 300-year-old trees, such as Stillhouse Bottom’s giant sentinel tulip poplar (see photo). The land was sold in the early 1960s and subsequent years have seen ownership of various parcels change from time to time. During the same period, botany professors and students, as well as numerous local citizens, visited the site in the spring to view one of the area’s best displays of wildflowers. The site, part of the greater Morgan Creek Bluffs Natural Area, is described in the Inventory of Natural Areas and Wildlife Habitats of Orange County as one of the most important natural areas in the county. Additionally, the site is within the larger Jordan Lake Macrosite, which includes the N.C. Botanical Garden Mason Farm Biological Reserve and New Hope Gamelands, all comprising a huge area of natural biological diversity. As early as 1965, C. Ritchie Bell, the first director of the Botanical Garden, began conversations with various property owners about preserving the site. This past Saturday was a very special day. Botanical Garden Assistant Director Johnny Randall held a press conference on the site to announce the purchase of 5.6 acres of undisturbed forest, bringing the Botanical Garden Foundation’s Stillhouse Bottom Nature Preserve to 23 acres. This special purchase was made possible through the generosity of local landowners, an Orange County Lands Legacy Program grant, a Town of Chapel Hill contribution and more than two-thirds of the funding from private donations. 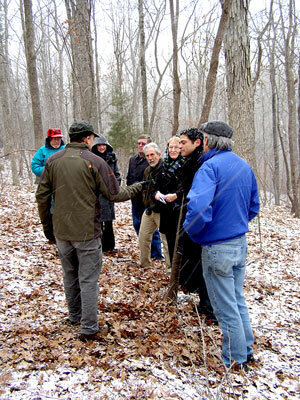 It was a magical moment, as officials from Orange County and Chapel Hill, Botanical Garden staff, Botanical Garden Foundation volunteers and several biologists joined Randall, in the midst of a dramatic passing snow shower, to express their enthusiasm for the preservation of this significant natural site. The story continues. Randall described ongoing efforts to secure additional adjacent lands, enlarging the preserve to 100 acres. Folks interested in supporting this effort are welcome to contact him at the Botanical Garden. There are no established human pathways in the preserve. Human impacts are limited to occasional seasonal walks scheduled by the Botanical Garden. PHOTO BY KEN MOORE. Undisturbed Stillhouse Bottom forest provides a safe haven for flora and fauna, including migratory birds. PHOTO BY KEN MOORE. Johnny Randall (front left) faces local officials to record comments celebrating the preservation of Stillhouse Bottom.